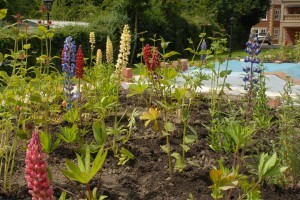 Originating in California Lupins are a beautiful flower and combine with other summer perennials like monarda and penstemon to create mid summer borders. Here in Darras Road ,Ponteland (near Newcastle) we designed and planted out a perennial border on a fantastic raised bed in the front entrance area of the driveway. The border timings are crucial. Its important to have flower combinations but also an extended period of planting as other plants begin to join in the border show. It makes you think of summer just talking about it all.